People love eating brownies. And you're going to love making them with Baked Chicago's Simply Decadent Brownies Cookbook as your guide. Author Harvey Morris shares tried and true - yet unusually decadent - brownie recipes that will turn on the taste buds of your family and friends. These recipes are easy to follow and simple to execute, with each recipe fitting on a single page and without creating a sink full of dirty pots and pans! Your guests will literally squeal with delight when you serve them the Bacon & Salted Caramel Brownies or the Marshmallow Pretzel Crunch Brownies. Your family will beg you to make the Deconstructed S'Mores Brownies or Chipotle Chocolate Brownies for Sunday dinner. And when your significant other tastes the Dark Chocolate & Raspberry Liqueur Brownies, well let's just say you'll be calling the shots. 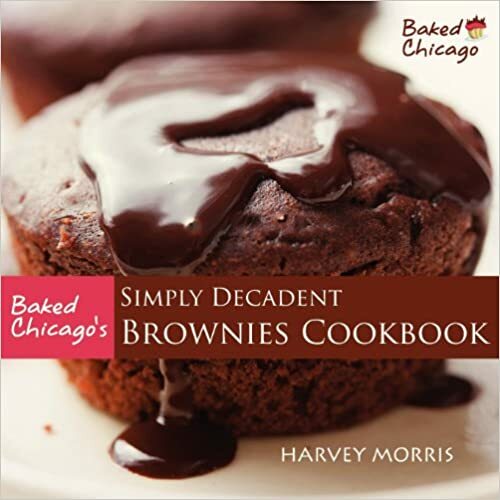 Filled with rich, colorful photographs and invaluable tips (aka Brownie Points), Baked Chicago's Simply Decadent Brownies Cookbook is a collection of deliciously simple recipes that every home cook will turn to again and again. In medium skillet, cook the bacon until crispy. Reserve 1/4 cup of the bacon fat and set aside. Let bacon cool and chop roughly. Set aside. Preheat oven to 350° F. Lightly grease bottom of a 9x9-inch baking pan with butter or shortening. In medium bowl, mix together flour, cocoa powder and salt. Set aside. In large heatproof bowl set on top of small saucepan of simmering water, melt dark chocolate and butter. Stir constantly, until smooth. Remove from heat and cool slightly. With electric mixer on medium-low speed, beat eggs, granulated sugar, and brown sugar until frothy (about 1 minute). Beat in melted chocolate mixture, bourbon and reserved bacon fat. Fold in flour mixture and pecans, just until combined. Spread the batter in the prepared baking pan. Sprinkle bacon on top. Bake for 35 to 40 minutes, or until a toothpick inserted in the center comes out nearly clean. Cool completely, about 1 hour. Cut into 4 rows by 4 rows to make 16 brownies.